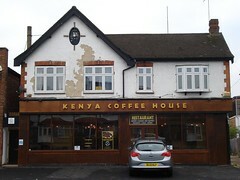 The Kenya Coffee House was a Kenyan restaurant and coffee shop in Romford. It has now closed, though according to email from the management in October 2018, they're looking for a new location to reopen in. Kenyan restaurant and coffee shop in Romford. It's quite smart inside photo, with light-coloured walls contrasting with dark wood-effect melamine-topped tables. Glasses and sugar containers are branded with their own "Kenya Coffee House" logo. Photographic prints of Olympic athletes and scenes of coffee-growing hang on the walls, and carved animals stand on the windowsill. The menu photo includes Kenyan specialities such as ugali (a thick cornmeal-based porridge/dough) and mukimo (potatoes mashed with green vegetables and sweetcorn), along with other items such as chapati and various curries reflecting the Indian influence in Kenyan cuisine. The main menu is available on weekdays, while on Saturdays, Sundays, and Bank Holidays they instead offer a buffet including several of the main menu dishes plus some extras. Pastries and various coffees and teas photo of menu are also available, and it seems to be fine to come in just for coffee. They don't seem to serve alcohol. Kake has visited a couple of times now. On a Thursday lunchtime in November 2013, there were no other customers when I arrived around 12:30pm, and this remained the case throughout my visit. On a Sunday lunchtime in February 2014, there were several other customers but plenty of spare tables. Music was playing on both our visits; Christian soft rock music the first time, and African music the second. It wasn't too loud on our first visit, but on our second we were seated directly beneath a speaker and it was a little hard to hear each other talking at times. In November 2013, Kake went for the fried tilapia (£9.50 including a side dish), and asked for advice on which side dish to choose. My waiter said that ugali would be the traditional accompaniment, along with a vegetable to stop it from being too dry; so I had the tilapia with creamed spinach (normally £3.50, but included with my main course) and ugali (£2.20, charged separately) photo. The tilapia was nicely seasoned though perhaps a little over-fried in parts. My waiter explained that normally it would be cooked on the bone, but they'd run out and only had fillets. For some reason the tomato and pepper salsa mentioned on the menu as coming with this never turned up (and I forgot to ask for it). The ugali was fine. The creamed spinach was really tasty, studded with pieces of sauteed red onion. In February 2014 we tried the buffet (£10.50/head) photo of buffet plate. This was a good selection consisting of fried fish, chicken wings, lamb curry, matumbo (tripe stew), mushrooms with red peppers in a cream sauce, creamed spinach, spiced rice, mukimo (potato mashed with other vegetables), chapati, samosas, coleslaw, salsa, and fruit salad. Service was friendly and helpful on both visits. When ordering a la carte, the food took over half an hour to arrive after ordering, which seemed a little slow. No service charge was added to the bill either time photo of a la carte bill, and on Kake's a la carte order they chose to include the more expensive of the side dishes in the main dish price, rather than the cheaper one, which was quite generous. Kake's verdict: I'd never had Kenyan food before, and this was a good introduction to it. I'd happily come back if I was in the area, whether for buffet or a la carte. I'd definitely eat that creamed spinach again. Child-friendliness: There's a pull-down baby change table in the accessible toilet, but nothing to put your nappy bag on while you do the change. Accessibility: No steps anywhere, just a couple of shallow ramps. There is customer parking directly at the front of the restaurant. The seats are half-round armchairs, but not overly narrow. There's an accessible toilet. Last visited by Kake and friends, February 2014. Last edited 2018-10-30 07:45:35 (version 6; diff). List all versions. Page last edited 2018-10-30 07:45:35 (version 6).